When you need an emergency electrician, you don’t have time to dance around Google trying to find a company located nearby that can not only get to you quickly, but is actually answering its phone! There are a number of scenarios you and your family might find yourselves in that require the prompt action from an emergency electrician in Melbourne. Below we’ve listed a few of the common culprits, and the dangers they pose. These household issues are commonly caused by people overloading circuits, but severe weather and poorly manufactured products can also contribute. Counterfeit knockoffs are known for putting people and homes at risk and can cause electrical fires. Homes and offices should be equipped with fire blankets and extinguishers, which can help control and put out a small fire. Never throw water on an electrical fire, as you risk electrocution. Electrical damage seems a little general, but often damage comes as a result of storms or other severe weather conditions. Any sort of building – whether it’s your home or office – can be affected by weather. In fact, a lightning current, if it’s strong enough, can actually burn up wires inside general household appliances, thus rendering them damaged. Electrical damage includes damaged switchboards, appliances, or power outlets, as well as appliances or electrical wires damaged by rain or flood waters. Don’t take the risk by trying to fix (or even inspect) a broken or damaged appliance. Call the pros. Safety switches provide more protection than you might think. They are essential to the prevention of electric shock from broken or faulty electrical products, so you really can’t afford to have a safety switch that is faulty or keeps tripping! The speed at which a safety switch shuts off power can prevent electrical fires and can save your life! A tripping safety switch needs to be immediately fixed by a licensed electrician. Electric shocks are scary. 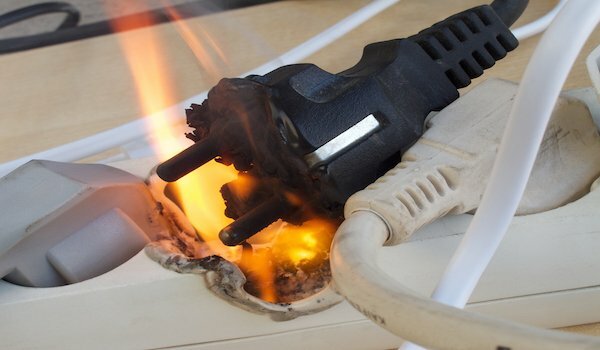 Any contact with an exposed live part will often cause electrical shocks (and/or burns), and shock victims often cannot let go of the appliance. It is therefore super important that you do not try to free them, as you then create a risk that you will get shocked, too. Sparks and smoke are the clear warning signs that a particular device, appliance, power board, or socket is damaged and is posing an electrical risk. The great relief to you and your family is that Briggs offers a 24/7 emergency electrical service to its Melbourne clients. No matter what day of the year, or what time of the day, if you’re wary of an electrical fault or damages, we’re just a phone call away. That severe storm or electrical fire won’t wait until 9am to strike, so why on earth shouldn’t you be able to rely on a 24-hour electrician? Briggs is an emergency electrician in Melbourne providing peace-of-mind emergency services 24 hours a day, 7 days a week. No job is too big or too small, and if you find yourself in a situation where electricity or an appliance poses a risk, you need prompt and reliable action. Call Briggs during an electrical emergency; better yet, why not save our number in your phone? 1300 300 222. Remember, if you or anyone around you is in immediate danger, call Triple Zero (000).